Muscle Works Nitro Whey is a protein shake for athletes building lean muscle and to increase fitness performance. Athletes supplement their protein they get from food with a specialised whey shake taken around their workouts. Each serving of this shake will give you 25 grams of quality muscle building protein sourced from whey concentrate and isolate. Arginine has been added to enhance the performance of this shake. Studies have shown that arginine is a precursor to nitric oxide (NO) which increases the ‘size’ of blood vessels. This allows for more blood to travel around your body. Better blood flow increases circulating oxygen which should improve athletic performance during training by giving you more endurance. The most important time get protein and carbohydrates into your body is around your lifting sessions. Weight training primes your body to use these nutrients more efficiently for muscle growth. Delivering more nutrients via increased blood flow to your trained muscles should bring you one step closer to your fitness goals! This shake has been formulated with BCAA’s which prevent muscle wastage during training and improve recovery. Better recovery between your gym sessions allows you to train more often and consistently at your peak. 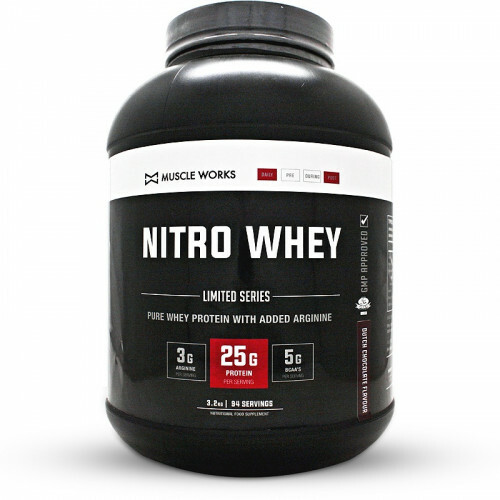 Muscle Works Nitro Whey is a protein shake with added ingredients to boost workout performance, better recovery and nutrient delivery for athletes looking for a competitive edge. Whey protein concentrate, whey protein isolate, Cocoa powder (in chocolate variant only), Flavourant, L-Arginine, L-Glycine, Xanthan gum, L-Leucine, L-Isoleucine, L-Valine, Sucrolose. Made in a factory that handles nuts, fish and soya. • Take 2 scoops (34g) and dissolve into 300ml water or skim milk. • Have your serving directly after training. • Follow a weight training program 3 – 4 times a week to get the best results from this shake.